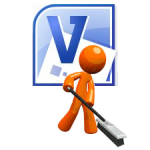 VisiBatchClean keeps your Visio file size to a minimum by removing unnecessary data. It extends the capabilities of our free VisiClean utility (features so useful, they've been added to Visio starting with 2007!) by enabling you to remove unused masters from a list of Visio files in a batch process. Have you ever wondered why a Visio file seems to be much larger than you would expect from the amount of graphics it contains? There are several possible causes of this but the most common is a buildup of "unused masters." When you drop master shapes from Visio stencils onto the drawing page a copy of that master is added to the drawing. As you delete shapes from the page Visio does not check to verify if the masters are still in use... it simply holds on to every master whether it is used or not and the file size may be substantially larger than necessary. These masters are contained in the file's Document Stencil that you can view by selecting File > Shapes > Open Document Stencil. You can manually select and delete masters on the Document Stencil but this is time consuming and tedious because you can't tell which masters are actually in use on the Visio drawing until you press Delete and a warning message appears to inform you that it is in use. VisiBatchClean provides a much better way to clear your files of these unused masters to reduce file size and improve performance. If you use Visio 2007 and later, you can use use the Reduce File Size feature to remove unused masters but this will require opening one file at a time to choose the proper menus. VisiBatchClean works automatically on as many files as you want without requiring you to open each individual file. Add documentation with formatted text and graphics directly to your shapes. For Visio 2007 and 2010 32-bit versions. Try it FREE for 10 days... click Download Sample.